Happy Midterm Election Day! 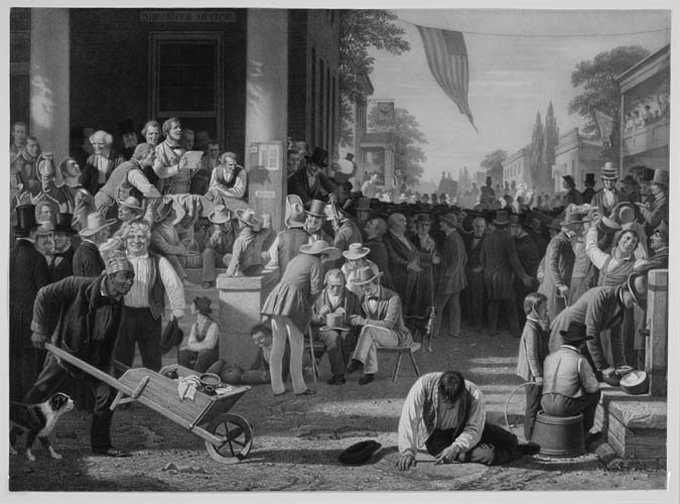 In honor of this very important day in our political process, we are sharing three prints by George Caleb Bingham. 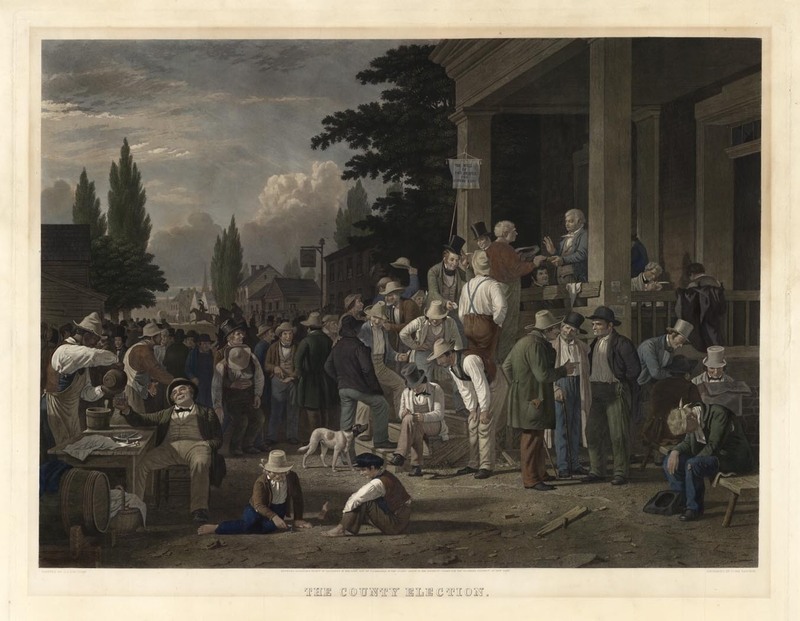 The County Election. George Caleb Bingham. Published by Goupil & Co., New York, Paris, London. 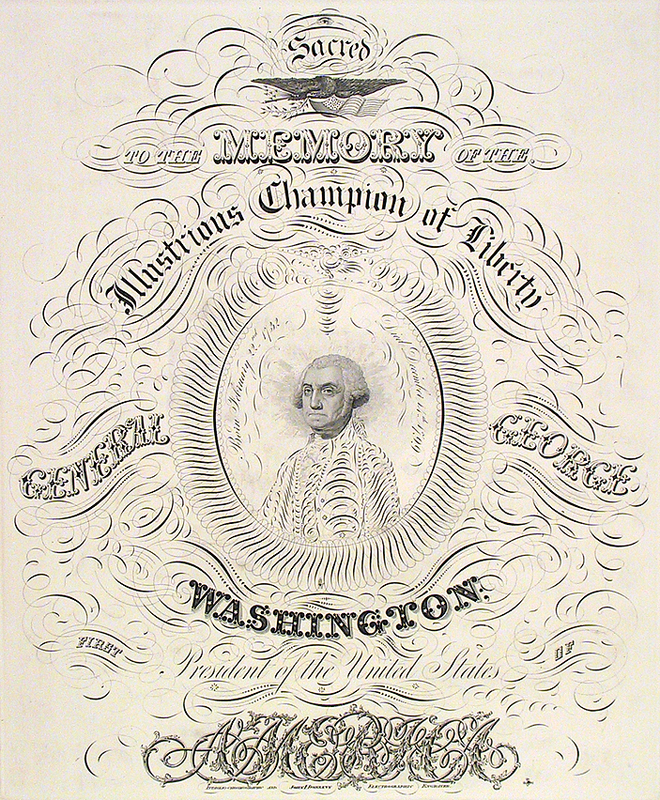 Stipple and line engraving,1854. 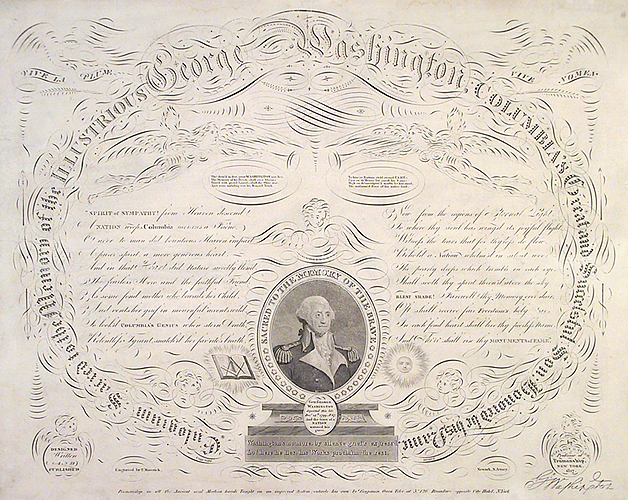 Engraved by John Sartain. Image size 22 1/4 x 30″ (564 x 760 mm) plus wide margins. At The Old Print Shop: LINK. George Caleb Bingham is considered by many to be America’s finest genre painter. 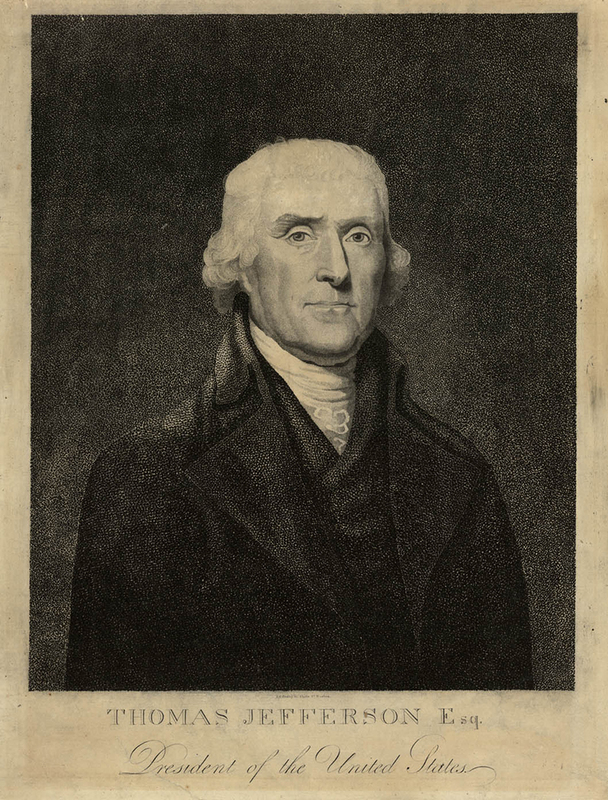 A number of his printed images, such as the one above, have a political theme. 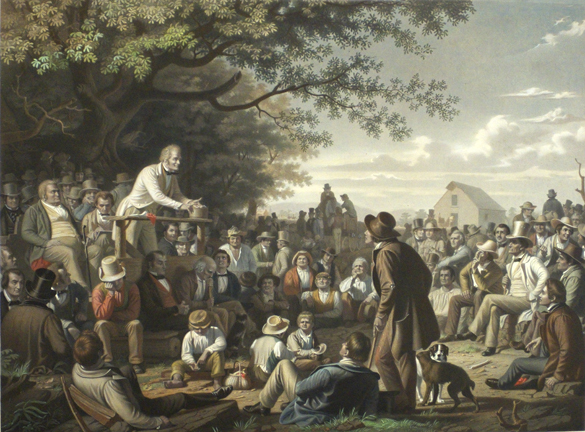 In 1840, Bingham was sent to the Whig convention at Rocheport, Missouri. It is believed that at the convention Bingham realized the artistic possibilities of the political scene and filled his drawing book up with sketches, which were later utilized for his large compositions. The other two large companion scenes to The County Election are Stump Speaking and the extremely rare Verdict of the People. Stump Speaking. By George Caleb Bingham. Published by Fishel, Adler, and Schwartz, 94 Fulton St., New York. Hand-colored stipple, line, and aquatint engraving, 1856. Engraved by Gautier. Image size 22 5/16 x 30″ plus title and margins. At The Old Print Gallery: LINK. The Verdict of the People. By George Caleb Bingham. Lithograph, 1858-59. 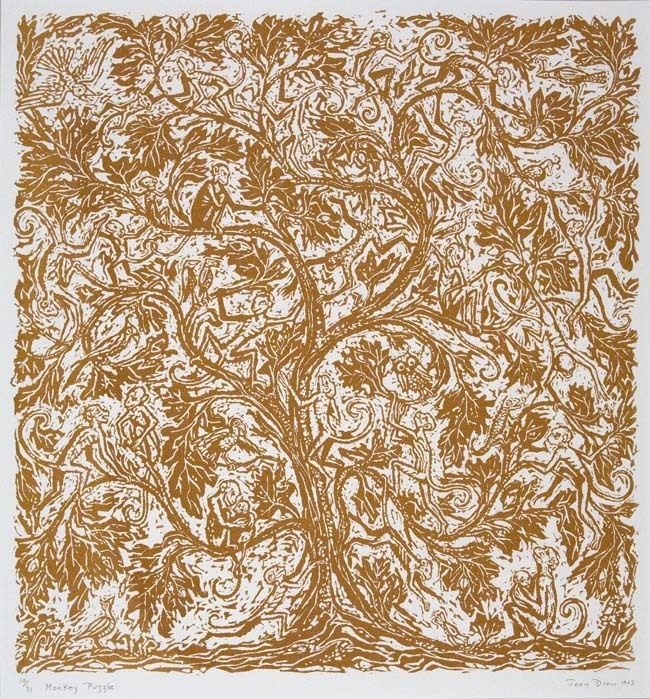 Paper size 21 5/8 x 29 3/4″ (549 x 755 mm). E. Maurice Bloch in George Caleb Bingham: A Catalogue Raisonne states that only two impressions of this print are known and both are proofs before title. The two known impressions in the 1967 catalogue were in the collection of Mrs. A. S. Colgate of Tuxedo Park, N.Y. (that impression is currently in the Amon Carter Museum in Fort Worth, Texas) and in the Estate of Curtis B. Rollins, Columbia, Missouri (location of that impression is unknown). Ascensions Aerostatiques Les Plus Remarquables. : Resume Historique de L’Aerostation. 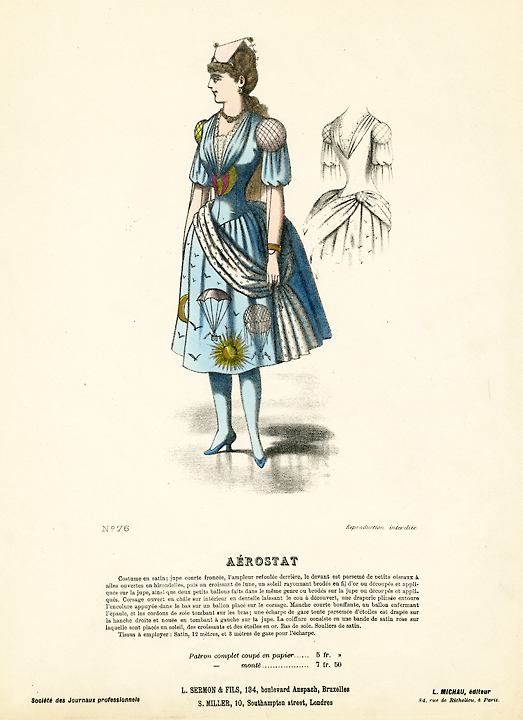 Published a Paris chez Barthelemier Freres, Rue Hautefeuille, 22 et 30. Engraving handcolored, 1851. Print lists 81 balloon flights starting with 1638 although the official first ascension was in 1783. A great history of balloon flight, with successful and tragic flights. Image size 18 11/16 x 26 7/16″ (47.4 x 67.1 cm). 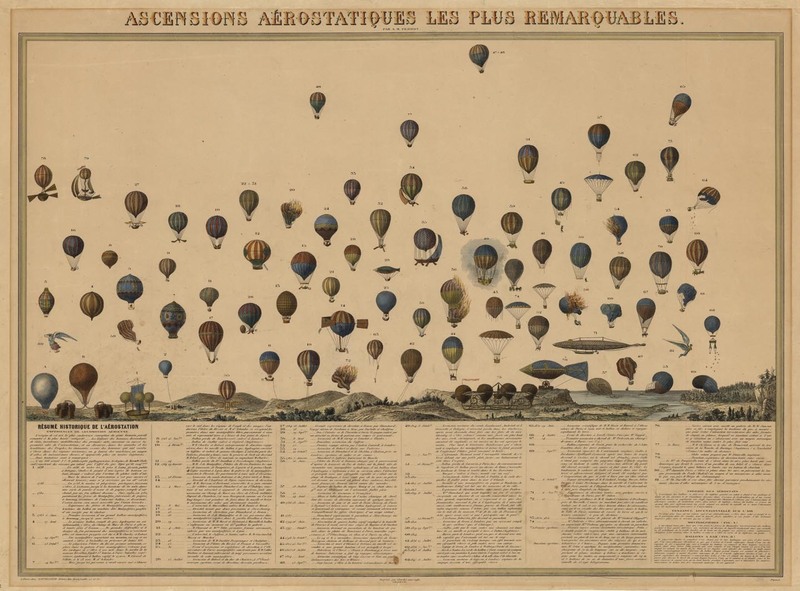 Of all the experimental and intellectual developments in the 18th century, none captivated both scientists and the general public more than balloon travel. Ballooning played an important part in early aeronautical development, the limitless expanse of sky beckoning scientists with hopes of exploration, excitement, and inexhaustible possibility. The first trepidatious voyages were described in eager and precise detail, and often included maps and diagrams of scientific observations. Early etchings and engravings were also made to capture the discoveries and milestones made by the scientists, explorers, and daredevils who braved the air. Below are several of our ballooning prints, selected from both our Georgetown and New York galleries. Be sure to click on the links to see more for our inventory. Details Geometriques de la Machine Aerostatique… Monsieur Jos. Montgolfier, le 19 June 1784. A Lyon chez Joubert fils, Graveur et Md. D’Estampes, G de rue Merciere. Etching, 1784. The first clearly recorded instance of a balloon carrying (human) passengers was built by the brothers Joseph-Michel and Jacques-Etienne Montgolfier in Annonay, France. These brothers came from a family of paper manufacturers and had noticed ash rising in paper fires, which led to their experiments with balloon travel. The Montgolfier brothers gave their first public demonstration of their invention on June 4, 1783. They stood on a circular platform attached to the bottom of the balloon and hand-fed the fire through openings on either side of the balloon’s skirt. The balloon reached an altitude of at least 500 feet and traveled about 5½ miles before landing safely 25 minutes later. Later that year, scientists Jacques Alexander Charles and Nicholas Louis Robert created the first gas-balloon, utilizing hydrogen to keep the balloon and basket afloat for a significantly longer period of time. Within the next ten years, numerous daredevils risked the skies with the help of silk balloons, wicker baskets, and new concoctions of gas and flame. 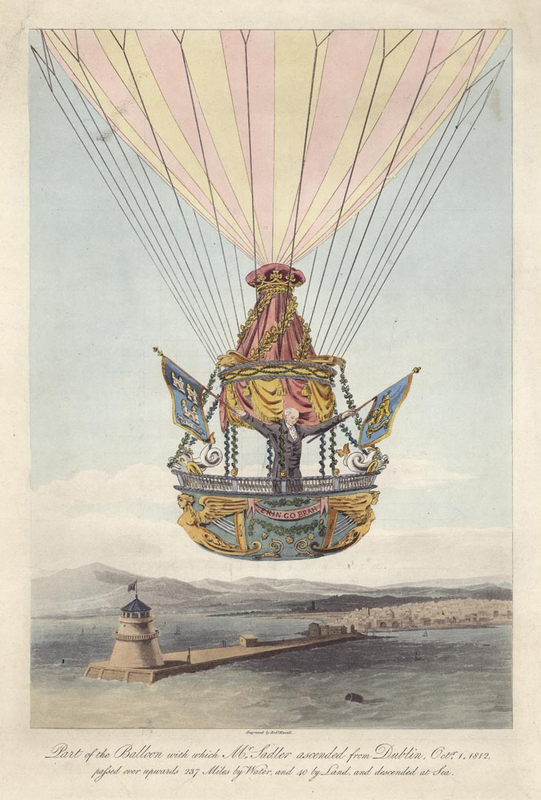 By 1785, the first successful crossing of the English Channel was accomplished by French balloonist Jean-Pierre Blanchard and American John Jeffries, using a gas balloon. They started in Dover, but once they were positioned over the water, the balloon lost altitude. The pair feverishly tossed all items from the basket, including their clothes. They landed safely in France two hours later, in nothing but their underwear. Mr. Vincent Lunardi Esquire. Stipple engraving, 1784. Oval size 4 3/4 x 4 ” ( 122 x 102 mm). 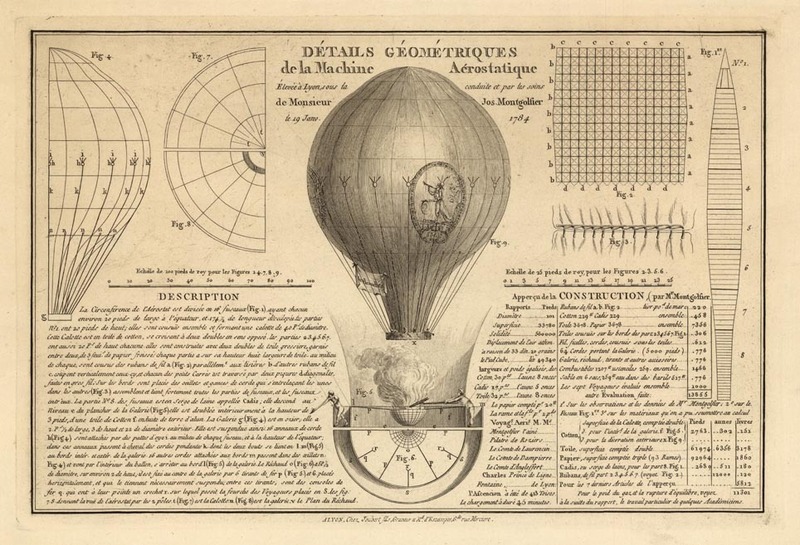 Most of early balloon flight and exploration occurred in France, with backing provided by the Académie Royale des Sciences. England was slow to catch on to the ballooning phenomenon. The first manned balloon flight in England was by Signor Vincent Lunardi, an Italian, who ascended from Moorfields on September 15, 1784. His gas balloon was outfitted with wooden oars, with the intended purpose of directional control. Fueled by the fervor surrounding Lunardi’s first flight in London, ballooning finally became a veritable craze in England. Aeronauts became the some of the most talked about celebrities of the day, and tales of their exploits and adventures swept across Britain creating a national mania for the sport. 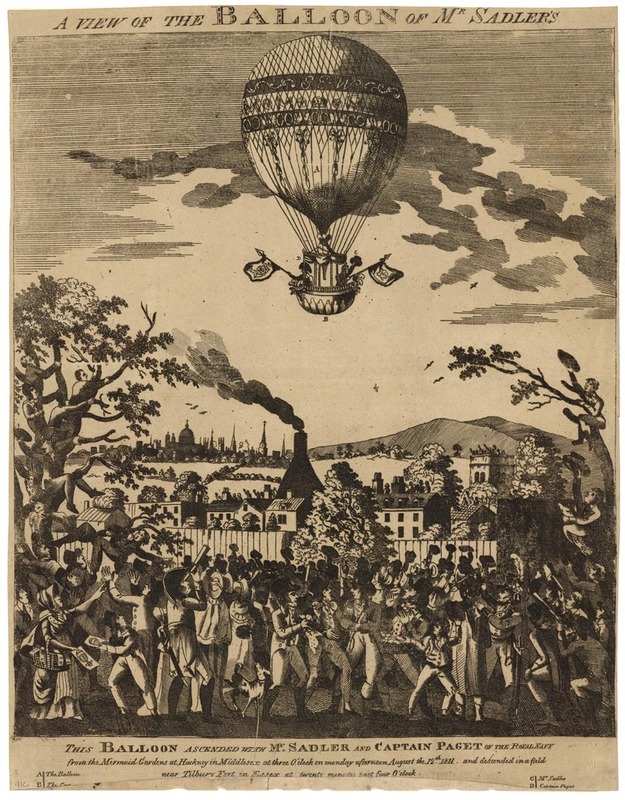 Whereas ballooning had been popular on the Continent since Pilatre and Rozier’s first flight in a “Montgolfiere”, it was not until Lunardi’s daring flight that it gained popularity in England. Exact Representation of the Grand Aerostatick Machine with which Mr. Lunardi ascended from the Artillery Ground Sep. 15 1784. Published by W. Wells, Sep. 28 1784, at No. 132, Fleet Street. Etching, handcolored,1784. Image size 12 x 8 3/4″ (305 x 224 mm). James Sadler Esq. First English Aeronaut. By Benjamin Taylor. Published by B. Taylor, No. 7 Brewer St. Golden Sq., London. Stipple engraving, 1812. 5 1/2 x 6 1/4″ (140 x 160 mm) plus title and margins. 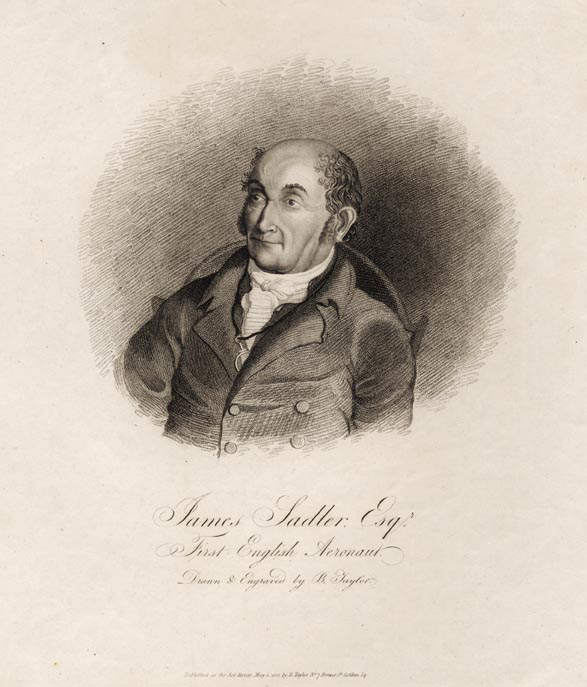 Nicknamed the “King of the Balloon”, James Sadler was considered the first English aeronaut. He made his first balloon ascent in 1784, the same years as Lunardi’s famous flight, flying from Oxford to the village of Woodeaton, six miles away. On October 7, 1811, he set a balloon speed record when he flew from Birmingham to Boston, Lincolnshire, in less than four hours. In 1812, he attempted to cross the Irish Sea, but failed, landing in the ocean near Anglesey where he was rescued by a passing fishing boat. 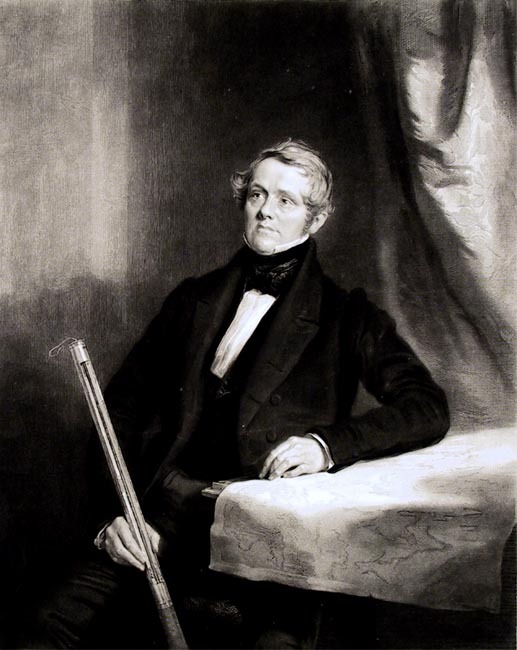 Sadler is remembered as one of the pioneers of aeronautical exploration in Britain and his daring flights helped make ballooning a national pastime. A view of the Balloon of Mr. Sadler’s. 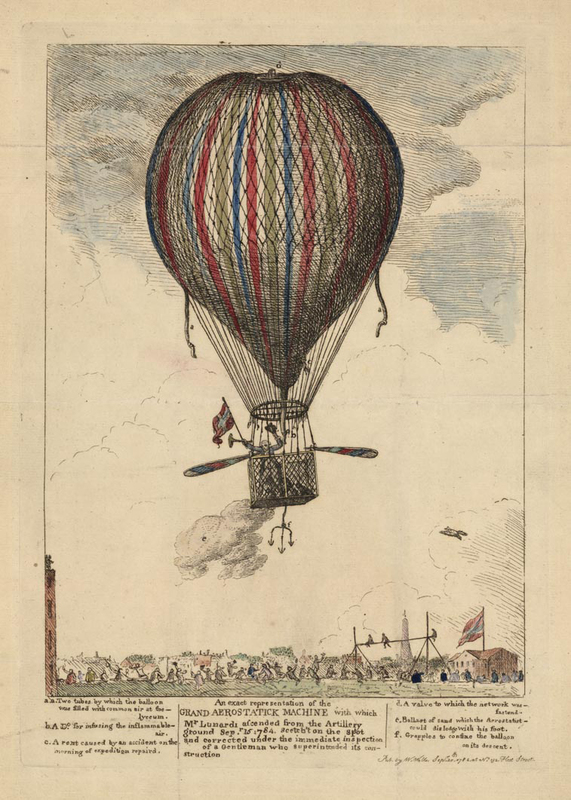 : This Balloon Ascended with Mr. Sadler and Captain Paget of the Royal Navy : from the Mermaid Gardens at Hackney in Middlesex at three O’clock on Monday afternoon August the 12th 1811 and descended in a field. Engraving, c.1811. Image size 16 15/16 x 13 7/8″ (415 x 354 mm). Part of the Balloon with which Mr. Sadler ascended from Dublin, Octr. 1, 1812. : passed over upwards 237 Miles by Water, and 40 by Land, and descended at Sea. By Robert Havell, Jr. Aquatint and engraving handcolored, undated, c.1812. Image size 13 1/4 x 9 1/8″ (337 x 230 mm). Charles Green was another celebrated English aeronaut, He was the first person to undertake an ascent in a balloon filled with carbureted hydrogen gas. Green made 526 ascents during the course of his daring career, many of which tested the boundaries of aeronautical aviation. An eccentric at heart, Green made an ascent off the back of his pony, a feat which won him a reputation as daredevil. He constructed the great Nassau balloon, in which he made his famous ascent from Vauxhall Gardens. In 1821, Green was the first aeronaut to demonstrate that coal-gas could be used to inflate balloons. Prior to this discovery, volatile hydrogen gas had been used which was extremely expensive and took up to two days to inflate a large balloon. Green also invented the guide-rope, which was used to regulate the ascent and descent of the balloon. Mr. Charles Green, The Aeronaut. By John Hollins. Published by Hodgson & Graves, London. Mezzotint, 1838. Engraved by G. T. Payne. 15 9/16 x 12 1/2″ (395 x 317 mm) plus title and wide margins. 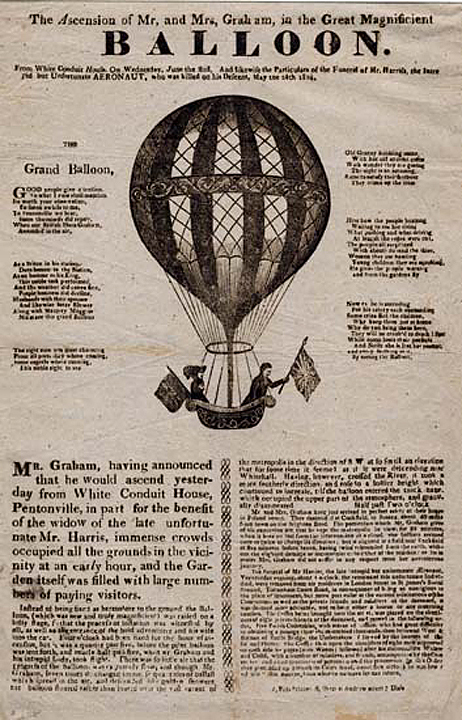 Ballooning became a significant part of popular culture. Spectators would gather to watch the balloons take off and land. Fashion houses drew inspiration from the lauded air explorers. The wealthy that could afford such luxuries would take trips in balloons. Once made maneuverable, balloons were even used by militaries. The first military use of a balloon occurred during the Battle of Fleures in 1784. The balloon L’Entrprenant was used by French Aerostatic Corps to watch the movements of the Coalition Army. The Ascension of Mr, and Mrs, Graham, in the Great Magnificent Balloon. Engraving, 1824. Printed below the image states “Mr. 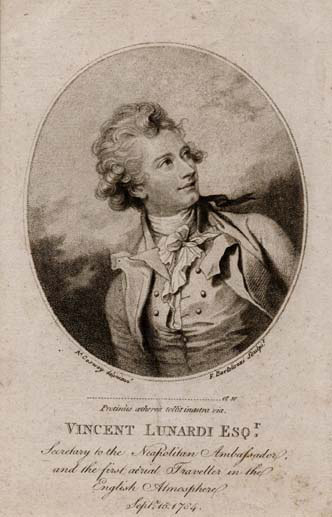 Graham, having announced that he would ascend yesterday from White Conduit House, Pentonville, in part for the benefit of the widow of the late unfortunate Mr. Harris, immense crowds occupied all the grounds in the vicinity at an early hour, and the Garden itself was filled with large numbers of paying visitors.” Image size 13 1/4 x 8 1/2″ (337 x 217 mm). 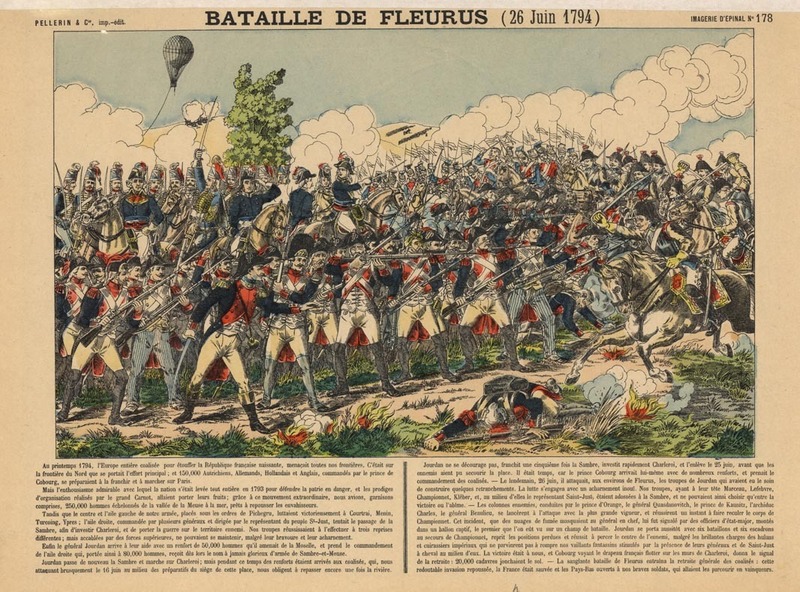 Bataille de Fleurus (26 Juin 1794). Engraving, hand-colored. c.1830. Pellerin & Co., imp-edit. Imagerie D’Epinal No.178. Image depicts the French military with a balloon tethered in the backgrounds. Image size 7 7/8 x 12 15/16″ (200 x 328 mm). Today we have a new P/P post, featuring two prints of monkeys. 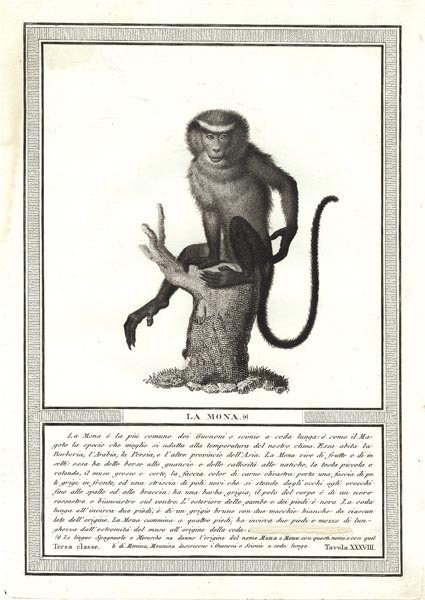 One is an early 19th century stipple and line engraving from “Storia Naturale Delle Scimie E Dei Maki..”, an Italian publication describing monkeys in their natural habitat. The second print is by 20th century artist Joan Drew. Drew is known for her playful and whimsical serigraphs. Serigraphy is a stencil method of print making, in which a design is imposed on a screen of polyester or other fine mesh, with blank areas coated with an impermeable substance. Ink is forced into the mesh openings by the fill blade and onto the printing surface during the squeegee stroke. The method is sometimes called silk screening or screen printing. Both prints are currently available in our New York gallery, The Old Print Shop. We invite you to visit their store in person ( located at 30th Street & Lexington Ave, in NYC) or view their prints online here: La Mona & Monkey Puzzle. Image on Left: La Mona. By Nicolas Henri Jacob. Published in Milano by Ferdinando Artaria, Gioachimo Bettalli, Fratelli Ubicini & Hugues. Engraved by L. Rados. Stipple & line engraving, 1814.